Importantly, anyone who specifies or orders any powder coating for external use for residential or commercial applications, needs to ensure that their specified coater has an active production laboratory and keeps records of testing. One of the crucial areas for production testing takes place around the pre-treatment or conversion coating, which is applied to the aluminium prior to powder coating. This pretreatment needs to be undertaken correctly and to a high quality to offer the aluminium both a complete seal to avoid corrosion and the powder coating a good key to adhere too. Test samples are regularly run through the powder coating plant with destructive tests carried out on these samples in the laboratory and recorded. Only when these samples meet a prescribed quality laid down in BS EN 12206-1 can the powder coater claim to coat to BS EN 12206-1. The QUALICOAT Standard is more up to date than BS EN 12206-1 as it is being updated on a continuous basis. The QUALICOAT Standard is unique in the way it is produced, being updated on a global basis by its own membership which is made up of the pretreatment suppliers, powder manufacturers and powder coat applicators. 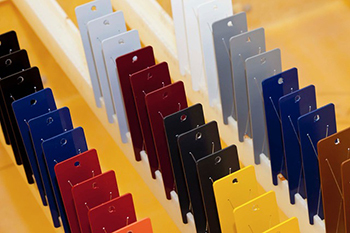 The standard is now widely recognised across the globe to offer a consistent standard for architectural powder coating and is widely specified by architects. Unlike BS EN 12206-1, QUALICOAT also insist on each applicator member being independently audited against the standard twice a year. IFO, based in the Netherlands, is the appointed independent inspectorate for QUALICOAT UK & Ireland and undertake unannounced visits on all coating members to ensure that process coating quality meets the QUALICOAT standard. Regular testing and record keeping is an important issue for the association and Mark Holz, MD of IFO, set up the ‘IFO Academy’ specifically for the training of laboratory technicians. Together with theoretical study during the two day training course, candidates review up to date testing practices and equipment. The Association can also be followed on Twitter at @Qualicoat.